This was our first attempt at trying to plan how to fill the remainder of our time in Vietnam. We devoted much of yesterday to this task. We were due to fly out of Ho Chi Minh City on the 4th November but having found our feet here we've now decided to extend our stay. The ubiquitous travel agencies that line Bui Vien Road offer open bus tickets, which make the commute up and down the country much easier (something we were unaware of until we arrived). Unfortunately, Vietnam Airlines was only open half day on a Sunday, which means that we will have to re-route our air tickets further up the line, at a bigger town like Hue. Changing these tickets will cost an additional £30 but since the bus journey from Ho Chi Minh City all the way up to Hanoi works out cheaper than a return bus ticket to Hoi An (which we were planning on doing from Ho Chi Minh anyway) this option is worthwhile. Well, this is how we justified it anyway and we would no doubt kick ourselves if we didn't take up this opportunity to see more of the country. With all the itinerary planning, budgeting and bus tickets arranged, it was time to wind down and say farewell to the South. This morning we embarked on the first leg of our trip to the North. The plan was to stop off at Nha Trang for the night as the bus journey up to this point would take ten hours and this seemed like a logical place to take a break. We stopped off at Mui Ne Beach halfway for lunch and caught a glimpse of palm trees, high sand dunes and the beach. The beach was empty; nothing along it except for empty resorts. We only had half an hour here but it looked idyllic - it was a shame we were on a tight time frame and could not stay for longer. 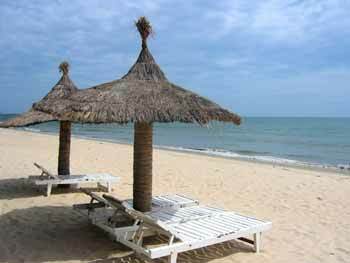 A very deserted-looking Mui Ne Beach. We must have arrived at Nha Trang at 6 o'clock in the evening. As we pulled into the busy town, the guide told us that there was no morning bus from Nha Trang to Hoi An - only an evening one (6.30pm - 6.30am). We put our heads together and did some quick thinking. If we stayed in Nha Trang overnight as originally planned, it would mean that we would lose one day and considering we didn't know whether there'd be anymore unexpected cancellations later on, we decided to stay on this bus and continue to Hoi An through the night. This basically meant that by the time we'd arrive at Hoi An we would have spent 23 hours on a bus. And this is precisely what we did. It was hard work: the last leg to Hoi An was especially challenging as, by then, our muscles were aching from having sat upright all day. The bus was also full and we didn't have a lot of legroom. As I shuffled in my seat trying to find a more comfortable way of sleeping (and of course, there was none! ), I grew increasingly irritable. Irritated by the noise on the bus, other people's legs stretched out invading the personal spaces of others, someone within close proximity with serious bowel problems, endless and seemingly needless repetitive coughing from the people directly behind, someone chatting on a mobile phone at 3 o'clock in the morning ... under these cramped conditions, every bit of noise seemed more exaggerated. But strangely enough, I eventually managed to catch some shut-eye and block out the noise. We arrived at Hoi An at 6.15am and crashed out straight away on the spacious hotel beds. What a day!